If you need a light meal following the Thanksgiving celebration, this Pomegranate, Pine Nut and Apple Salad is hands down one of the best salads I’ve had this fall. And if you think you don’t like kale, you must try this salad and reevaluate your position. This salad is simple to make but delicious on so many levels… a little sweet from the apples and maple dressing, a bit of red pepper heat from our Glory Kitchen Penang nut & spice mix, earthy flavors from the wild rice, and a burst of sweet juiciness from the bright red pomegranate seeds. If you want a more substantial salad you could always add some leftover turkey, however, this was quite filling on its own. It seems that kale is on every menu these days and for good reason. Not only is it a trendy green but it is loaded with all types of health benefits; vitamins A, K, C, B6, Manganese, Calcium, and the list goes on. It’s filled with antioxidants and when prepared properly, it can be really delicious. The key is to pick the right type of kale, cut it well, and massage it with olive oil to break down the cells of the tough leaves. My personal favorite leaf is Tuscan kale, also called lacinato, because of its dark color and smooth texture, but there are many other varieties such as curly, red leaf and others which are all worth a try. Add this salad as a side to your meal or make it large enough to enjoy as a salad entrée – I can’t wait to make this one again. Mix all the ingredients for the dressing and set aside. To grate the ginger & garlic, I use a microplane and grate it right into the mixing bowl. I also don't bother peeling the ginger before grating, however, you may prefer to peel some of the skin off. TIP: I often buy a large root of fresh ginger at the market and cut it up into approximately 1" pieces. Then I store the small pieces in a zip lock freezer bag and keep it handy in the freezer to use whenever I need fresh ginger. I just use it frozen, grate it on a microplane and it works beautifully - this way you always have a knob of fresh ginger handy! After washing and drying your kale, stack the leaves upon one another then roll into a cigar-like fashion. Using a chef's knife, slice it into small pieces then place into a large mixing bowl. I like to remove the thicker part of the stalks located at the base of the leaf. Drizzle the kale with a bit of olive oil, sprinkle with 1 teaspoon of Penang nut & spice mix, sprinkle with a bit of sea salt, then massage the oil & spices into the kale. 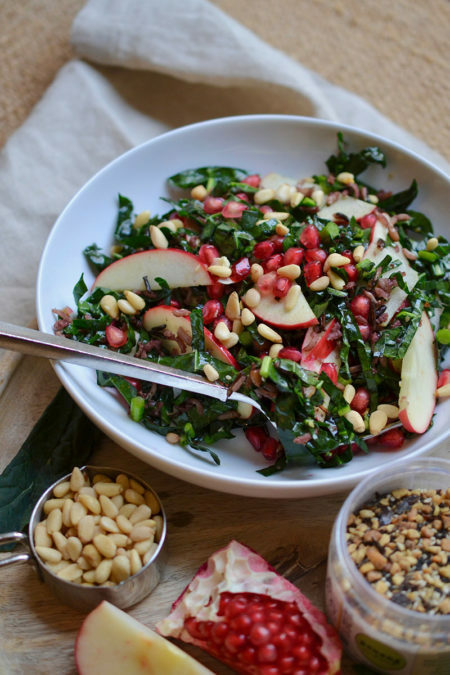 To the kale, add the wild rice, pine nuts, thinly sliced apples, and pomegranate seeds. Toss gently and serve. other Glory Kitchen nut & spice blends which would work well with this salad are Cairo, Mumbai, Provence or San Miguel.